Diamond & Jewelry Buyers address, phone, website, and more. 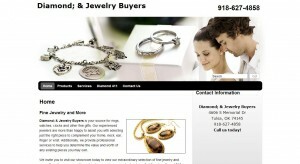 Diamond & Jewelry Buyers is your source for rings, watches, clocks and other fine gifts. Our experienced jewelers are more than happy to assist you with selecting just the right piece to complement your home, neck, ear, finger or wrist. Additionally, we provide professional services to help you determine the value and worth of any existing pieces you may own.